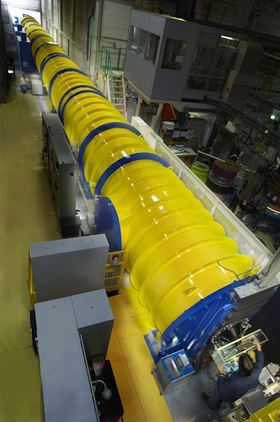 The D11 beamline at the ILL where the neutron scattering experiments were carried out. Image courtesy ILL.
One day when the FIFA World Cup comes around, you may well be watching the highlights on a TV you can roll up into your bag and unfurl for unfettered football viewing. Martin Hollamby of Keele University, UK and Takashi Nakanishi of the National Institute for Materials Science, in Japan, and their colleagues have demonstrated a new way to endow the soccerball-shaped molecules - fullerenes - with amphiphilic properties. These materials might one day form the basis of a flexible alternative to LCD screens and have other applications. Writing in the journal Nature Chemistry, the team describe various investigations, including cryogenic tunneling electron microscopy, small-angle X-ray scattering and small-angle neutron-scattering experiments on the materials [Hollamby et al., (2014) Nature Chem; DOI: 10.1038/nchem.1977]. The team's efforts take the concept of amphiphilic assembly one step beyond detergents and other simple amphiphiles and exploits it in an otherwise entirely hydrophobic molecule, fullerene. The team added detergent-like hydrocarbon tails (n-alkanes or partially conjugated chains) to the fullerenes and found that in organic solvent these would aggregate into clusters of fullerenes with a surrounding shell of carbon chains. "Changing the chemistry of the chains can even lead to larger assemblies, such as gels made of bundled fullerene wires that have a measureable (photo)conductivity," explains Hollamby. "By adding pristine fullerene in place of the solvent, we instead prepare a sheet-like material now with totally different properties." The neutron scattering experiments alongside complementary X-ray scattering, carried out at SPring8 Japan, uncovered the internal structure of the molecular aggregates ranging from the nanometer scale up to a few tenths of a micrometer revealing their core structures. Cryo-TEM measurements, carried out at the Technical University of Eindhoven confirmed these structures visually. The level of control over the self-assembly process fine tuned by changing the precise chemistry of the hydrocarbon chains allows the team to adjust the physical properties of the systems in an unprecedented way. One area in which these aggregates could find immediate applications is in the burgeoning field of molecular electronics. Carbon-based electronics devices could be much cheaper to manufacture than conventional silicon semiconductor technologies. The inertia of the immense semiconductor industry is unlikely to be overcome in the very near future. Nevertheless, such carbon devices could lead to flexible circuitry and displays of the kind that would be far less fragile than current solid-state gadgets such as mobile phones and tablet computers. They also offer the possibility lower power consumption, which means longer battery life and so more time to watch the football! Hollamby told Materials Today that, "Apart from expanding the amphiphilicity concept to a wider range of molecules (other than fullerenes), we're also going to try to use external control (e.g. a strong magnetic field etc.) to improve the quality (i.e. alignment) of assemblies that form in the materials that are reported in this paper." He adds that the aim in that case is to make a truly "bulk" structure - for example a perfect gel fiber that extends over much larger dimensions than reported. "This could clearly lead to much higher conductivity than we got from the gel in its natural state - particularly in the alignment direction," he says. The team also plants to make bulk heterojunction solar cells from co-assembled hydrophobic amphiphiles, in which one of the pi-conjugated sections (perhaps) fullerene behaves as the electron acceptor and the other as the donor. Scientists have developed a liquid crystal elastomer with auxetic properties, meaning it gets thicker when stretched.